Whoa! Hi! I’m back. Where have I been all this time? I haven’t put my comics in their long-boxes for over a month now! I’m a terrible human being. But aside from what, where have I been? Aside from reading comics and working, I went to a concert of Devin Townsend on Wednesday (yes, I updated the setlist). Keeping the details short, I met him – he is my idol – I was front row-center – and I walked away with the setlist and his guitar pick. Win! Then I performed a concert on Thursday with my band Superheroes (click to add us to Facebook! ), while also spending the past two weeks practicing and recording Superheroes first EP for said show. We managed to sell a few copies yesterday, so thank you to everyone who supported us and came out! We had a blast! As a side note, despite the name, we do not sing about superheroes. Sure, I may put a few action figures on my amp, but that’s the extent of it. But what a week of interesting news! Martin Sheen is confirmed to be Uncle Ben in the new Spider-Man movie, while Sally Field is in-talks for Aunt May. Also, Scott Pilgrim comes out on Blu-Ray Tuesday, which I am very excited for. I loved the movie, as well as the books. The books were definitely better, however, the movie was done extremely well. I applaud both versions. Of course I went to a bar on the Saturday (the 30th) and I saw a guy dressed as Captain America. Going up to him as the Red Skull, he had no idea who I was! Brutal! My other friend dressed up as the Black Cat and ran into a Spider-Man/Spider-Girl couple costume. As she spoke with them, neither knew who she was as the Black Cat! What sort of injustice is this?! Suddenly it’s cool to be dressed up as a superhero not knowing anything about it? That’s almost as bad as me dressing up as a Power Ranger and not knowing who Zordon was, or as Luke Skywalker and not noticing Darth Vader walking past me. I just think it’s ridiculous. Anyway. If you like, I’ll review my favourite comic of this week! Deal? Okay! Despite a hefty week of comic collection for me: Chaos War #3, Namor #3, X-Men: To Serve and Protect #1, and Generation Hope #1, the best comic went to Taskmaster #3! Taskmaster is a pretty unknown Marvel villain. I mean, he is popular, but there are more popular ones out there. This is Taskmaster’s second miniseries, but has been around the Marvel U for decades. You may have seen him recently in the Siege series, helping Osborn’s dark reign upon Asgard. Since the defeat of H.A.M.M.E.R., Taskmaster’s whereabouts have been unknown. 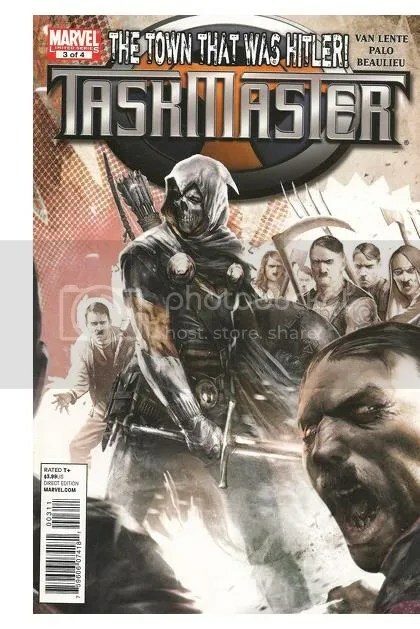 To make a long story short, various villainous agencies, such as HYDRA, A.I.M., and so on have teamed together under one group called the Org, and are trying to stop Taskmaster from, well, being alive. Only, he doesn’t know why. Here, you should stop reading unless you want to hear ***SPOILERS***. Well in the story, we find out from Nick Fury, talking to Steve Rogers, that Taskmaster is ex-SHIELD. I know, eh? And the reason why the Org is trying to stop him is because he knows too much. But Taskmaster doesn’t remember – and we find out why in the story (I’ll leave that spoiler for you to read). Regardless, the story develops so much in this third issue that there is so much to talk about! 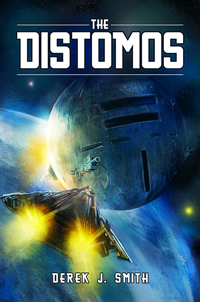 Firstly, the cover! A Town of Hitlers! Yeah. Read the story. Secondly, the humour is off-the-charts with this book. I mean, it’s coming off as a more serious Deadpool comic to me. We have a wise-cracking villain who is trying to discover his past while the world of villains is being thrown against him. We get to see Taskmaster do some great moves with his powers (which we also find an origin for), while we are also introduced to a new villain named Redshirt. This villain, although very serious, has some of the funniest panels I’ve seen in recent comics. Writer Fred van Lente is from The Incredible Hercules fame, so his story-telling would naturally have a sense of humour while still making massive plot still seem stable to the Marvel U. Mixed in with Jefte Palo’s art and Jean-Francois Beaulieu’s colours, and you have yourself a great story with fantastic images and a twist – literally – on every page. Although it has some radical story-telling, Taskmaster has turned to be quite possibly one of my favourite mini-series this year. As for me folks, I plan on having an article posted sometime next week involving blogs and storytelling. It may not even be comic-related (although highly likely)! Thanks for hanging in there folks! Good review! very well written. I debated picking up this series, but never got around to it. maybe i will pick it up in trade.